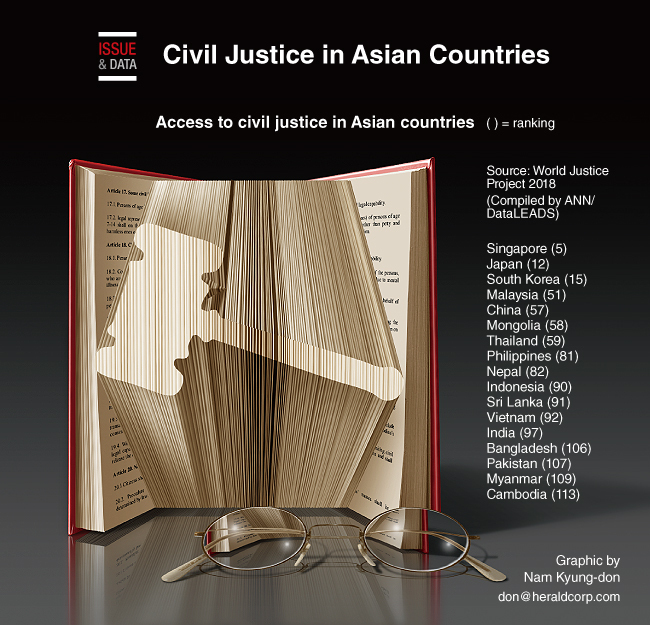 According to the World Justice Project, Singapore has the most accessible and affordable civil justice system in Asia while Cambodia has the worst civil justice system in the region. It ranks second-lowest in an index of 113 countries. Korea was ranked 15th in the world and third in Asia. The World Justice Project measures the access of people to civil justice system of their countries on the basis of how people perceive their access to the system free of discrimination. It measures the access on factors including justice is free of discrimination, free of improper government influence, effectively enforced, accessible and affordable. Singapore is the only Asian country to figure in the top 10. It is ranked fifth out of 113 countries globally. In 2016, the country established a committee to ensure accessible justice to its diverse population. Japan, ranked 12th in the world, has been working gradually toward being a rule-oriented society where individuals are given more access to justice system thus ensuring social equality.